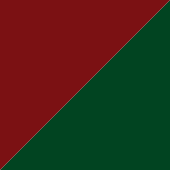 The University uses unique academic regalia, called the "Sablay," which is a sash patterned after the centuries-old sash academic regalia of Scandinavian universities. The "Sablay" is a sash joined in front by an ornament and embroidered or printed with the University's initials in Baybayin script and running geometric motifs of indigenous Filipino ethnic groups. 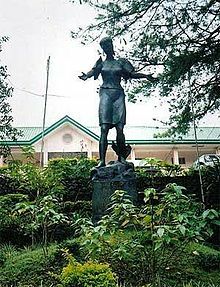 It is traditionally worn over a white or ecru dress for females or an ecru barong Tagalog and black pants for males, although there has been instances wherein the Sablay is worn over other indigenous clothing. 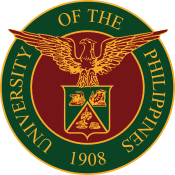 Candidates for graduation wear the sablay at the right shoulder, and is then moved to the left shoulder after the President of the University confers their degree, similar to the moving of the tassel of the academic cap. 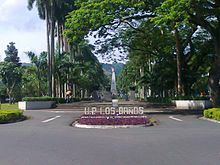 ^ "University of the Philippines". Top Universities. Quacquarelli Symonds - Wikipedia. Retrieved March 9, 2019. 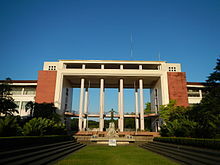 ^ "University of the Philippines World University Rankings". Times Higher Education (THE). Times Higher Education. Retrieved March 9, 2019. 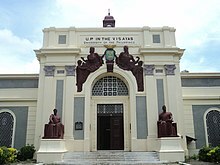 ^ "University of the Philippine". Top Universities. Quacquarelli Symonds - Wikipedia. Retrieved March 9, 2019. ^ "Best universities in the Asia-Pacific region 2019". Times Higher Education (THE). Times Higher Education. Retrieved March 9, 2019. ^ "Emerging Economies University Rankings 2019". Times Higher Education (THE). Times Higher Education. Retrieved March 9, 2019.